Giant ramparts guarded Altai Mountains against attack from the north, says leading archaeologist Professor Andrey Borodovsky. The wall complex - now almost hidden to the naked eye - is believed to date from a long era that also saw such constructions as the Great Wall of China and Hadrian's Wall. Concealed under thick layers of turf are huge stones put in place by ancient man, says the scientist. Six rows of a parallel wall system limited access to the Altai Mountain complex from the north via the valley of the Katun River. Their width is a substantial ten meters with an impressive height of up to eight meters. It is not known who built the giant ramparts. 'To the east of these walls is a fairly wide passage, which is limited at the mountainside by another series of walls, oriented west-east across the Katun valley,' he said. There are nine walls adjacent to the mountain slope. 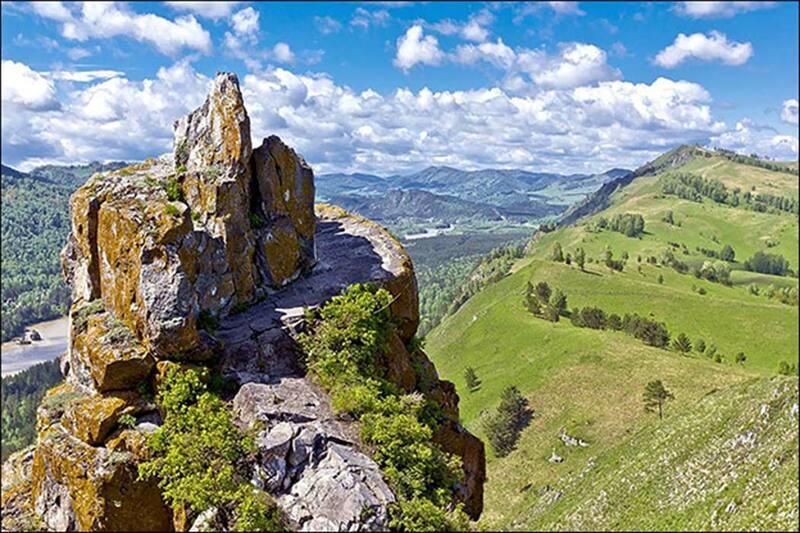 In this way access from the steppes to the mountains - the home of ancient civilizations, for example of the Pazyryk people - could be controlled. Some of the walls were destroyed by the construction of the Chuya highway in tsarist times, modernized by Stalin using prisoner labor. The western section of the ramparts were substantially lost when the modern-day village Souzga was widened. 'It is not easy to photograph the walls so that they are visible,' Andrey Borodovsky said. Nor do satellite images help much. Yet Prof Borodovsky insists geophysical analysis using scans shows the structures here were manmade not natural. He has announced plans to conduct detailed research here next year, which - while not long in total length, with more than 1 kilometer identified - are high in historical significance. So far archaeological evidence of man from the areas around the walls points to a medieval presence yet the researcher from the Institute of Archaeology and Ethnography in Novosibirsk is convinced proof will be found of their construction much earlier. 'Geophysics has clearly confirmed that the Souzga walls were artificially created,' he told The Siberian Times. 'It is not very easy to determine the age of such constructions, when exactly they were created, but I believe it was around the first millennium BC - the beginning of new era. That is Iron Age or even Bronze Age, but more likely - Iron Age. I'm basing this on the fact that it was the time when such constructions are created all over the world, for example the famous Hadrian's Wall also fits into this trend. The problem is that the only archaeological finds around these walls, as of now, are dated as medieval. Andrey Borodovsky said: 'All the impressive defensive lines in Eurasia were built in the period from the beginning of the first millennium BC up to the opening half of the first millennium AD. This is the era of late Bronze Age and early Iron Age, including the Hunnish time on the eve of the Great Migration of Nations. Such a fortification process was due to a number of factors. 'We remember the Great Wall of China, which was formed over several centuries and basically built by the third century BC, and Hadrian's Wall in Britain, at the decline of the late Roman Empire. The article Discovered: the Great Wall of Siberia dating to '1st millennium BC' ’ originally appeared on The Siberian Times and has been republished with permission. Interesting, but, there was similar and even stronger 'evidence' of a treasure train underground in Poland. Why not show us some sign of a rock worked by man? A few chisel marks would be more convincing than the scans offered. This Musical Instrument Still Works 1,700 Years After a Hun Nomad Crafted it! Read more about This Musical Instrument Still Works 1,700 Years After a Hun Nomad Crafted it! Extinct Denisovans from Siberia Made Stunning Jewelry. Did They Also Discover Australia? Read more about Extinct Denisovans from Siberia Made Stunning Jewelry. Did They Also Discover Australia?